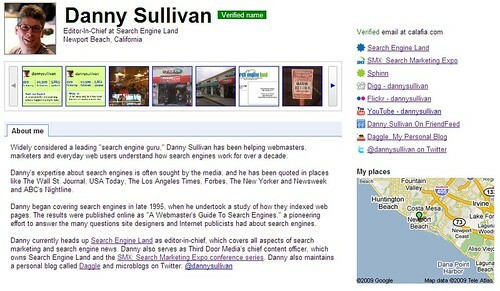 Google Profiles existed long before the launch of Google Buzz earlier this month. 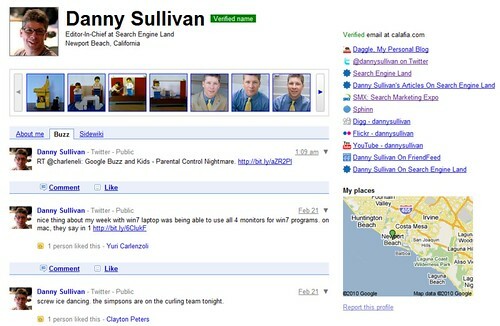 But since that time, Google Buzz has hijacked Google Profiles in a way unmatched by any other Google product. That’s bad news for those who want to fully opt-out of Google Buzz. Doing so kills your Google Profile. It’s also bad news for those who wanted Google Profiles to focus on you as an individual, rather than what you’re Buzzing about. For those unfamiliar with Google Profiles, see our Hoping To Improve People Search, Google Launches “Profile Results” post from last year. It’s a good introduction to how Google Profiles were repositioned as a way for people to have virtual business cards about themselves, hosted by Google and designed to help ensure that individuals could be found in Google’s special “profile results.” Indeed, Google even did a promotion that transformed Google Profiles into real business cards. That’s right. My profile has been Buzzjacked, as I like to call it. It makes no sense. If someone is searching for me (or someone else) and finds their Google Profile in search results, why do they want to be shown Buzz activity over a general introductory page? Or why does Buzz get the nod over Sidewiki comments, which also show on a profile page? Or why doesn’t Google My Maps activity get a tab on the profile page. After all, My Maps is linked to your Google Profile. How’d Buzz Get Into My Google Profile? Now let’s first review how Buzz ends up on your Google Profile in the first place. That’s important for understanding how to remove Buzz from your profile, if you decide you don’t want it there. Say yes to some of these, and you’ll get another screen prompting you to create a Google Profile, if you don’t already have one, so you can participate in Buzz. Did you do all that? Then now you’ve got a Google Profile that, by default, shows your Buzz activity. The first option — to show or not show Google Buzz in Gmail — doesn’t really opt you out of Buzz. It just hides the Buzz link from showing up in Gmail. If you’ve made any Buzz posts, this doesn’t remove them from your public profile Instead, you have to delete each post individually. Then you have to disconnect any linked sites. Then you have to unfollow anyone you were following. A lot of work, to get the Buzz off your profile. The easier way unfortunately goes all medieval on your profile. Select that “Disable Google Buzz” option, and you’ll really be taken out of Buzz. Everything you’ve done will disappear, and your Google Profile will get nuked, as well. It’s crazy. As I’ve covered, Google Profiles existed before Buzz and serve other Google services than just Buzz. Indeed, Google made a big push to get people to set these up last year simply as a way to ensure they could be found for their own names in Google. Killing your profile just because you don’t want to have anything to do with Buzz is overkill. That’s what’s frustrated Marsha Collier, who was shocked to learn this weekend how her profile had been Buzzjacked. She’d been using her profile exactly as Google had promoted the service last year, as a virtual business card. With the Buzz change, it no longer served that purpose, to her. You can, of course, get your profile back. But you have to rebuild it from scratch, reentering any information you may have had in the profile before Buzz took it over. Once you’ve done that, as long as you don’t reenable Buzz, then your profile will stay Buzz free. I talked with Google about these issues today. I was told that the feedback so far has been that most people who want to fully opt-out of Buzz also don’t want to have a profile at all — that’s why there’s the “kill Buzz, kill your Google Profile” option. That might change in the future. Also, Google’s aware that some people might prefer to chose which tab shows by default on their profile. So maybe in the future, you’ll be able to make “About me” show rather than “Buzz” by default. Overall, the Google Profiles madness is just another sign of how rushed Buzz was and what a mess Google’s social efforts have been in general over the years. There appears to be no coordinated social plan. SideWiki does whatever the hell it wants with Google Profiles, as does Google Maps, as does Buzz. The Buzz comes along and gets the power to wipe out Google Profiles, regardless of whether other services use them. And yet further services ignore Google Profiles entirely. On the upside, maybe Buzz will be the glue that finally binds all these social efforts at Google together and gets them organized. I also have no doubt the Buzz team is working as hard as it can on feature requests and bug fixes. Still, things like sacrificial profiles remain frustrating, as does the fact that as we go into our second week of having Buzz, those with Gmail accounts through Google Apps still can’t participate in Buzz. Or that you’re still forced to reveal your Gmail address if you want to be more than a number on Buzz. Or that I still cannot get connected sites to work as advertised. Despite linking our Search Engine Land feed to our Search Engine Land Buzz account, Buzz still refuses to pick up our stories. Ironically, if it weren’t for Twitter, we wouldn’t have a story feed there at all. Buzz recognizes Twitter as a connected site but not our own site!